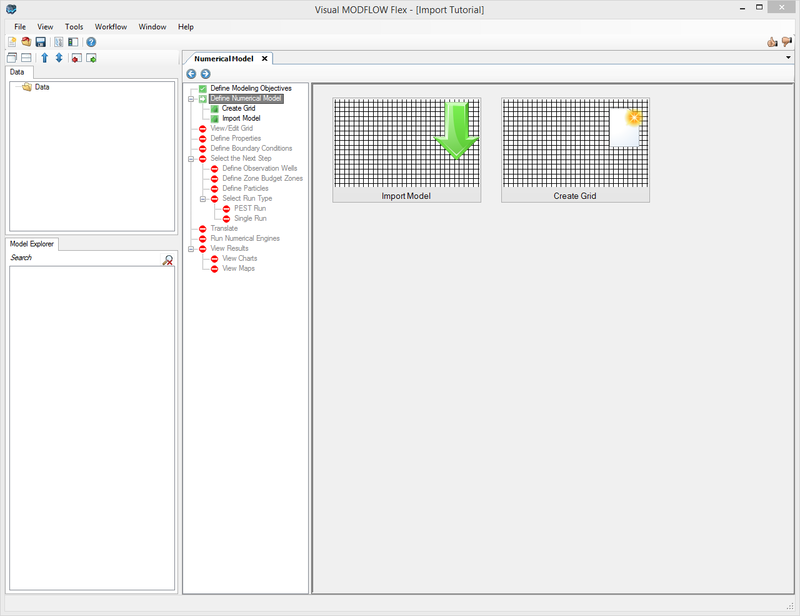 The following example is a quick walk-through of the basics of importing an existing Visual MODFLOW Classic or MODFLOW data set. The release of Visual MODFLOW Flex v5.0 introduced a new method of importing Visual MODFLOW Classic projects. This new method simplifies the process to import an existing Visual MODFLOW Classic project. The new method combines the 'Create a new project' and 'import model files' processes into a single step. This section describes the new procedure for importing Visual MODLFOW Classic projects. 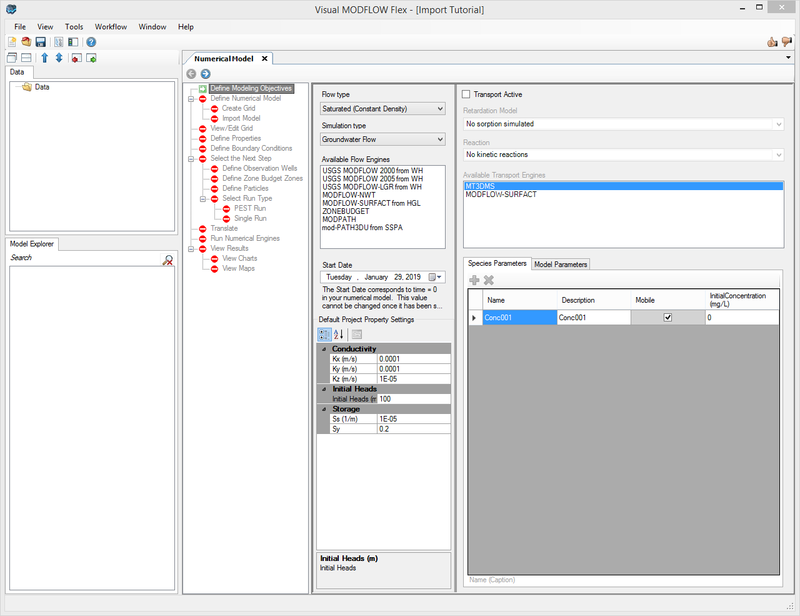 The old/customary method of importing Visual MODFLOW Classic and other MODFLOW projects is covered in the next section (Create the Project and Import Model Files). If you import your Visual MODFLOW Classic project using this new method, please follow the steps in this section, and then skip ahead to the 'View/Edit Grid' section. Please note that this method does not work for other MODFLOW projects, it is specific to the import of Visual MODFLOW Classic projects. •Launch Visual MODFLOW Flex . •Select [File] then [Import Project..]. •Browse to the location of your Visual MODFLOW Classic project and select the Visual MODFLOW Classic file (i.e. wellhead-capture-zone.VMF file). 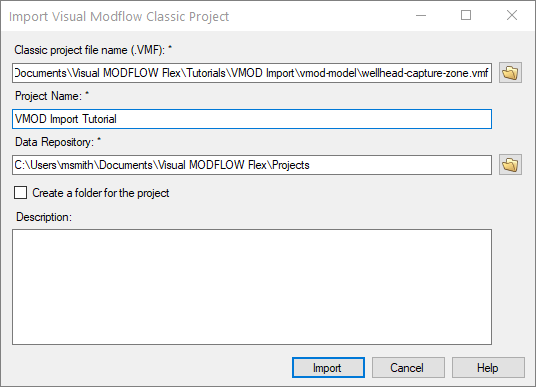 •Enter a project name for the Visual MODFLOW Flex project (by default it will enter the same project name as the Visual MODFLOW Classic project). 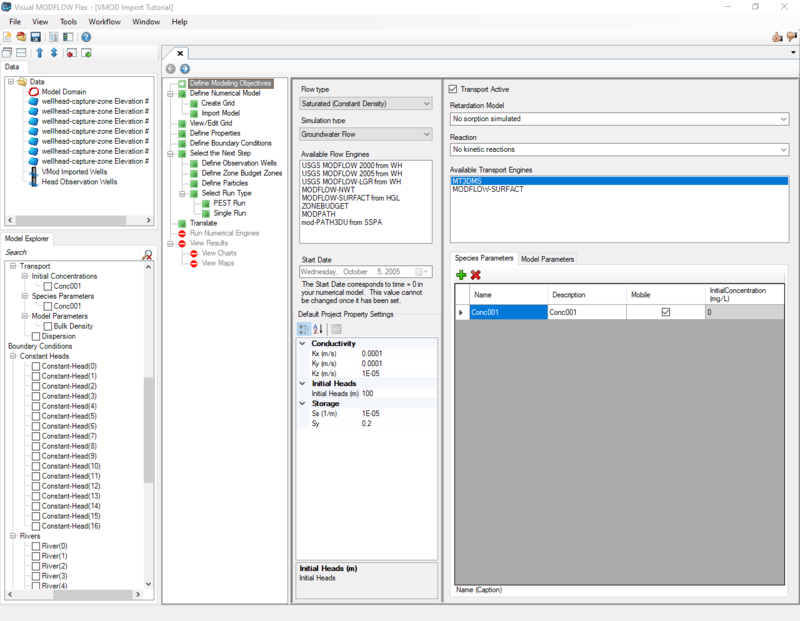 •Select a data repository for the Visual MODFLOW Flex project, select whether to create a folder for the project, and provide a description as required. The dialogue window should indicate that all model elements have been imported successfully. The following model components will be loaded: grid, model properties, boundary conditions, MODPATH/ZoneBudget inputs (i.e. zones, particles) and observation data. You can now continue with the regular numerical modeling workflow by proceeding to the section of this tutorial titled View/Edit Grid. 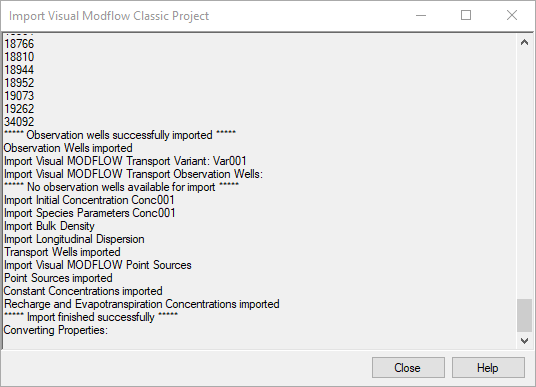 This section describes the procedure for importing MODFLOW project files (developed independently of the Visual MODFLOW Classic/Flex interface) into the Visual MODFLOW Flex interface. This procedure can also be used to import Visual MODFLOW Classic projects, but the procedure outlined in the previous section (for Visual MODFLOW Classic projects) is more streamlined. •Select [File] then [New Project..]. The Create Project dialog will appear. •Type in the project name 'Import Tutorial'. •Click the [ ] button, and navigate to a folder where you wish your projects to be saved, and click [OK]. •Define your coordinate system and datum (or just leave the local cartesian as defaults). •For this project, the default units will be fine. •Click [OK]. The workflow selection screen will appear. 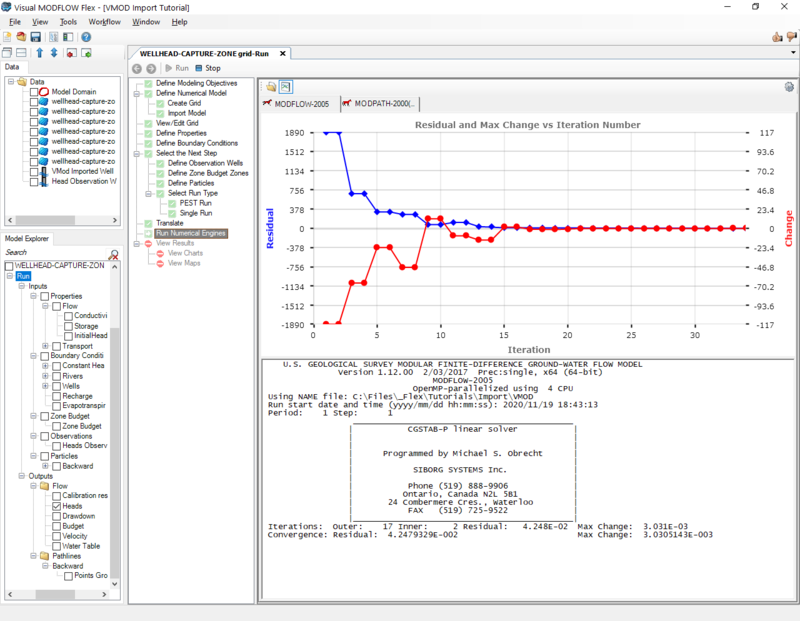 •Select [Numerical Modeling] and the Numerical Modeling workflow will load. •In this step, you define the objectives of your model and the default parameters. •At this step, you can choose to create a new empty numerical grid, or import an existing project. •Click the [Import Model] button. •Navigate to the folder that contains your Visual MODFLOW or MODFLOW project. •Select the file (.VMF [VMOD Classic] or .NAM [MODFLOW] file) and click [Open] to continue. The import will start and you will see the status in the progress window. 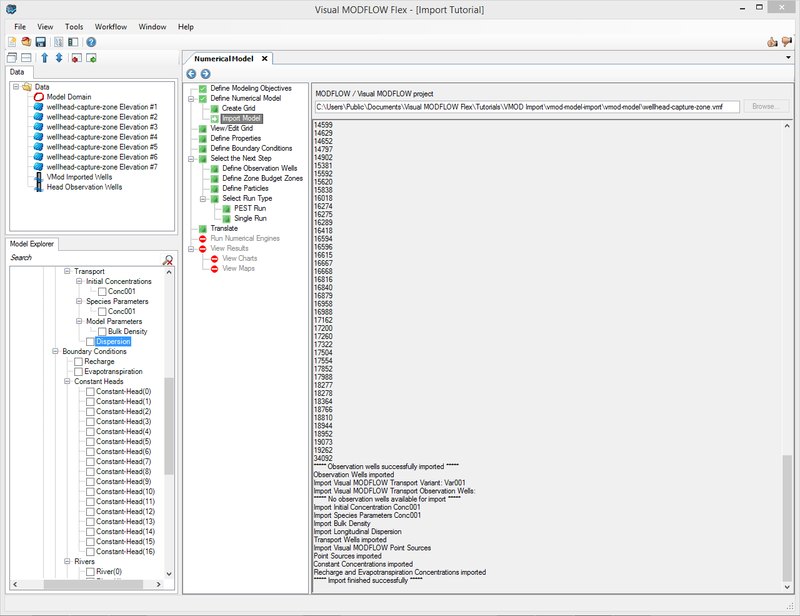 •Flex runs a series of validation checks on the MODFLOW projects you import and will display warnings for any anomalies it finds. 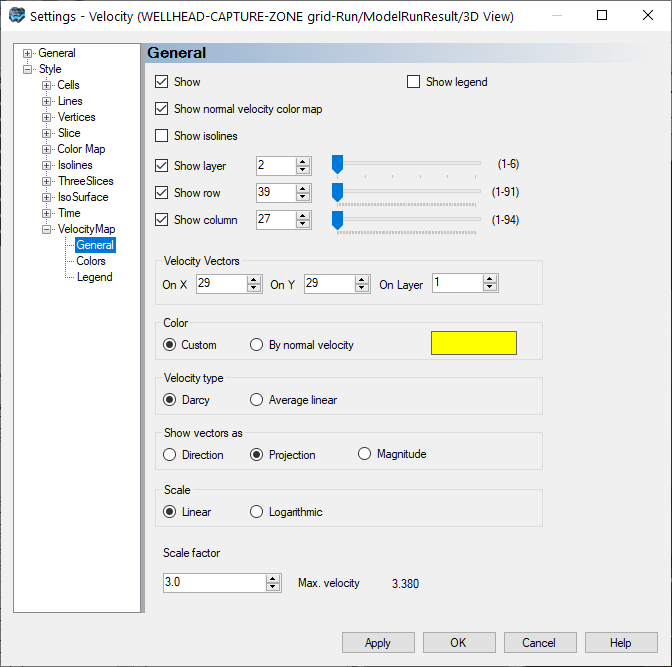 In the example project provided for this tutorial, Flex will warn you that the wellheads-capture-zone.mbu file is missing from the project you are importing. 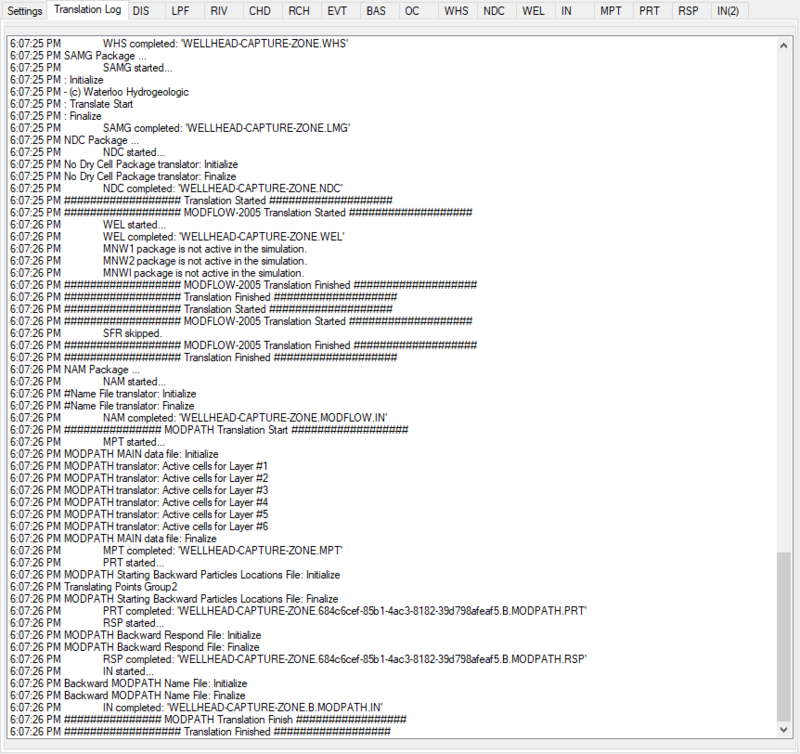 •The status of each model element import is shown in the main window; any detected errors will be shown here. •After the import, you will see the 'Model Explorer' is populated in the bottom left corner of the screen; from here, you can show/hide different model inputs/outputs. Please Note: You can add other data objects to the model, such as an image or other raw data (polyline/polygon shapefiles). These files need to first be imported, then they can be displayed at the one of the subsequent steps ('View Grid', 'Define Properties', 'Define Boundary Conditions') or in a 3D viewer by selecting [Window] then [New 3D Window], then checking on the box beside the appropriate data object. •Click [ ] (Next Step) to proceed, where you will arrive at the View/Edit Grid step. •At this step, you can view the numerical grid in layer (plan) view, cross-sectional (along row or column), and 3D view. 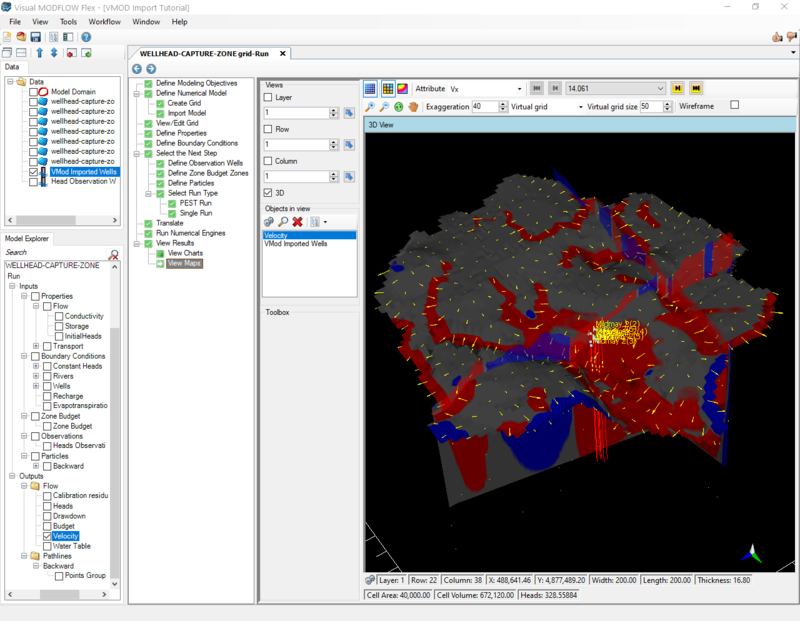 •Under 'Views', select the various views you want to see in the Flex viewer; VMOD Flex allows you to simultaneously show a layer, row, column and 3D Views. Place a check box beside the desired view and it will appear on the screen. •Adjust a specific layer, row, or column using the up/down arrows. Alternatively, click on the [ ] button then click on any specific row, column, or layer in any of the 2D views, and the selected row, column, or layer will be set automatically. •The standard navigation tools allow you to zoom, pan, and in the case of 3D view, rotate. •Click [ ] (Next Step) to proceed to the Properties step. 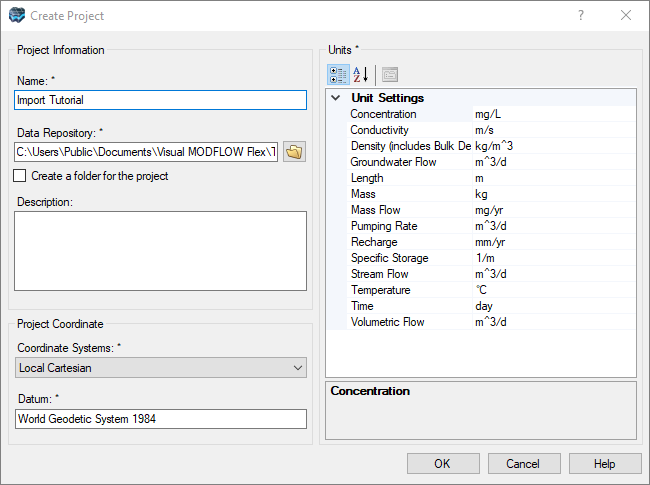 •At this step, you can view/edit the flow properties for the model. •Under the Toolbox, use the combo box to select from the various Property Groups: Conductivity, Initial Heads, and Storativity. •For each parameter group, you can choose to render by Zones or by a selected attribute. Based on your selection, the color rendering in the views will change. 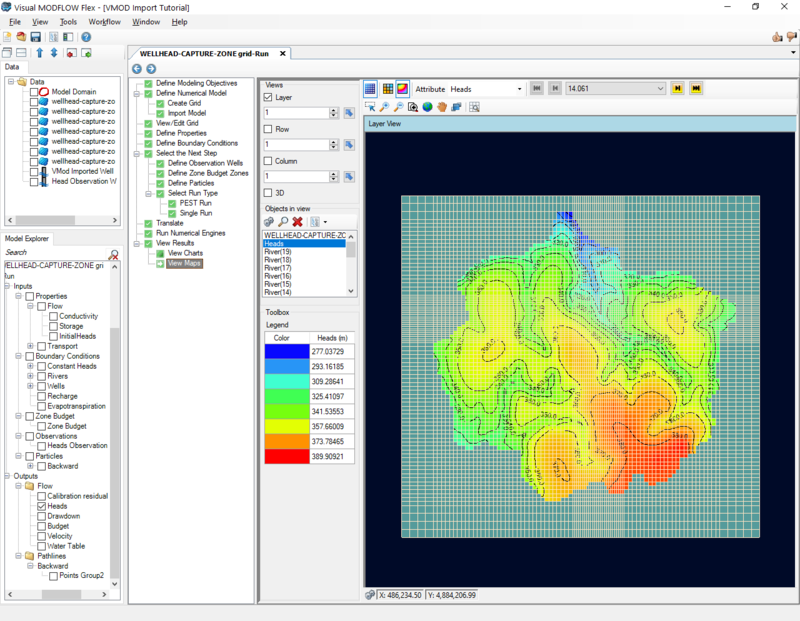 •Click [Edit...] button to see the conductivity zones that exist in your model and the values in each individual cell. •Use the same tools as described in the previous step to manipulate the views. •The display tools will allow you to switch from discrete cells rendering to color shading/contours. •At the bottom of the display, you will see in the status bar the position of your mouse cursor in the current view (XY) grid position (Layer, Row, Column), grid dimension (cell width, length, and thickness), and the Zone ID or attribute value for the selected cell. •Click [ ] (Next Step) to proceed to the Boundary Conditions step. •At this step, you can view/edit the flow boundaries for the model. By default, Constant Heads (if any) will be displayed in the model. In order to see other boundary conditions, you can set these to visible from the Model Explorer (check on the appropriate cell groups or boundary condition category). Also, when you choose another boundary condition from the Toolbox (eg. River), then this set of boundary condition cells will become visible. 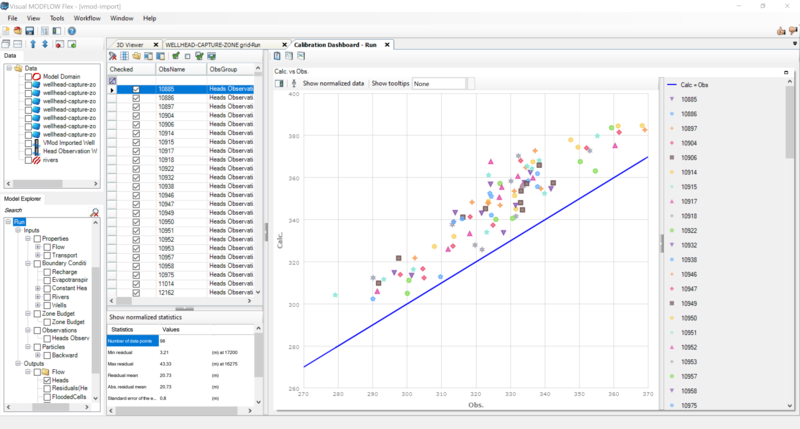 •Click on a cell that belongs to the boundary you are interested in; a dialog will appear where you can see the parameters for all cells in that boundary. 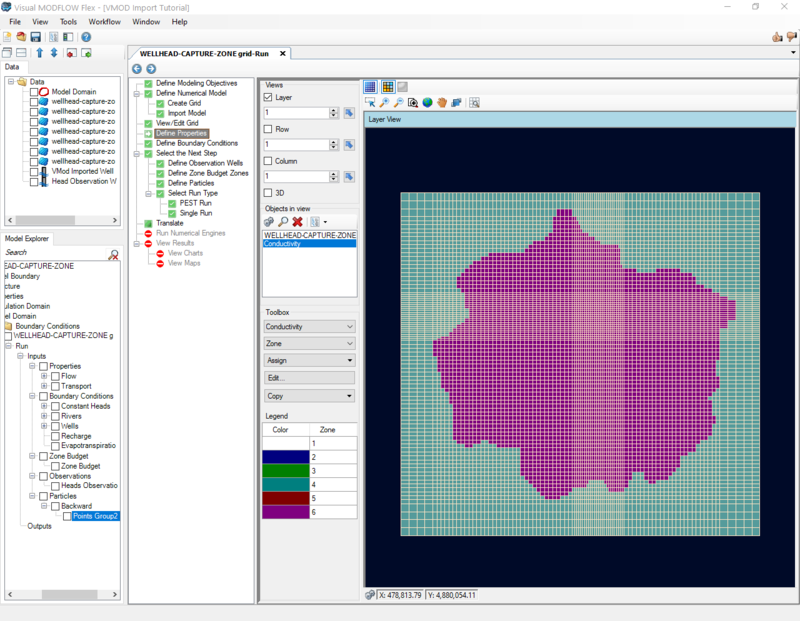 If you want to switch to see values in a different boundary, you can select it in the grid view and the dialog will automatically update to show the new boundary. •For Recharge or Evapotranspiration, you need to select this Boundary Condition type from the list under the Toolbox, and the Recharge/EVT zonation will appear. A [Database] button will be enabled allowing you to view the zonations. •You will arrive at a choice screen; here you can proceed to some of the “non-essential” inputs for the model, such as Zone Budget Zones, Particle Tracking, and Observation Wells. Or, you can proceed to Running the simulation. •You will arrive at the 'Select Engines' step. 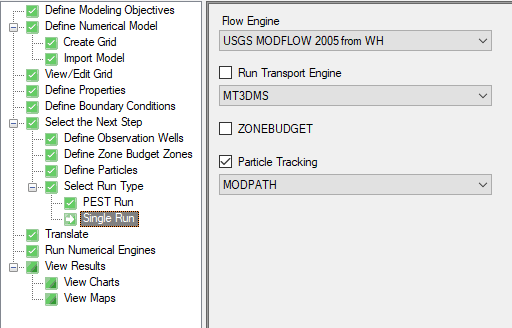 Here you can choose what engines you want (what version of MODFLOW: 2000, 2005, etc..), and if you want to include MODPATH and ZoneBudget in the run. •The version of MODFLOW that you used in the VMOD Classic model should be selected by default; if you wish to run MODPATH and ZoneBudget, be sure to select these engines as well. Please Note: ***De-select MT3DMS engine. *** since there are no transport inputs defined for this model. •You will arrive at the 'Translation Step'. 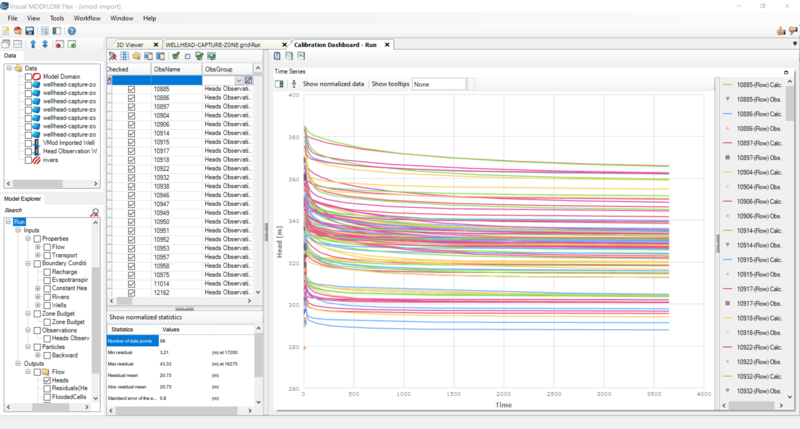 •At this step, you choose if the model is steady-state or transient, choose the solver you want to use, and define any other MODFLOW package/run settings, such as cell-rewetting, etc. For more details, see MODFLOW Translation Settings. Please Note: in the General Settings, there is a default location where the MODFLOW and other files will be generated. •Click the [ ] button to proceed; this will read the input from the numerical model and “translate” this into the various input files needed by MODFLOW and the other engines. The files will be created in the directory defined in the previous step. •Click the [ ] (Next step) button to proceed. You will arrive at the “Run Engines Step”. •Click the [ ] button on the main workflow toolbar to start running the engines. You will see the Engine progress in the scrolling window. 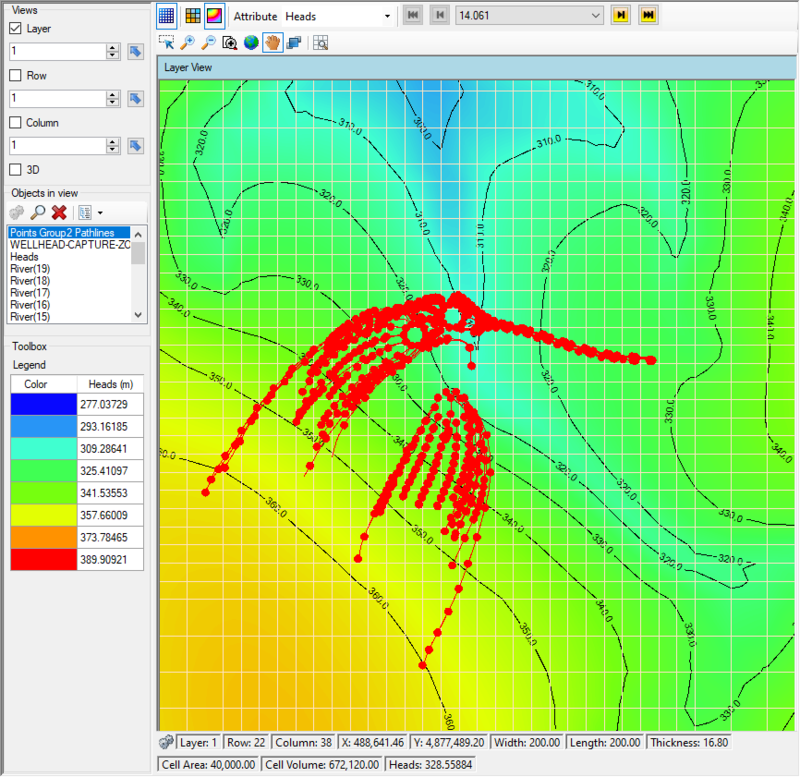 •Note that after a successful run, the Heads and Pathlines items will be added the tree in the model explorer. •Once finished, Click the [ ] (Next step) button to proceed. •You can then choose to view results in the form of Maps (Contours and Color shading) or Charts. •Click the [View Maps] button. •You will then see color shading of the calculated heads, in layer view. •If your model is transient, use the time controls above the Flex Viewer to change the output time; as you do this, all active viewers (layer, row, column, 3D), will refresh to show the heads for the new output time. •If you ran MODPATH, you will see Pathlines appear as a new node in the 'Model Explorer' tree under Output; add a check box beside the Backward Pathlines (i.e. [Points Group1 Pathlines]) to display these in the active 2D/3D Viewers. You may need to zoom into the middle of the layer view to see the pathlines. The pathlines are well represented in a 3D Viewer. •From the Data explorer (raw data), turn on the check box beside "VMod Imported Wells"
•Take a moment to rotate your 3D view, and zoom in, and you can get a display similar to the one shown below. You can also display velocity vectors, which will allow you to easily display and interpret flow fields. Velocity vectors may be displayed using average linear or Darcy velocities. In-plane velocity vectors can be displayed using the full magnitude of the vector (i.e. the out-of-plane velocity component will be included), as a projection (i.e. only the in-plane velocity component is displayed), or simply a directional indicator (i.e. the size of the arrow is not dependent on the actual velocity). By default, the velocity vectors will initially be displayed as a projection with average linear velocity values, on a linear scale. A normal velocity color map function is also supported, which allows you to interpret flows perpendicular to the selected layer/row/column (i.e. out-of-plane flow). By default the normal velocity color map will be displayed with a red/blue color scheme, with red areas indicating flow inward (i.e. corresponding to the positive X, Y or Z direction), and blue areas indicating flow outward (i.e. corresponding to the negative X, Y or Z direction). Areas with velocities below the specified in-plane range threshold will be displayed using the specified In-plane color (which is grey by default). 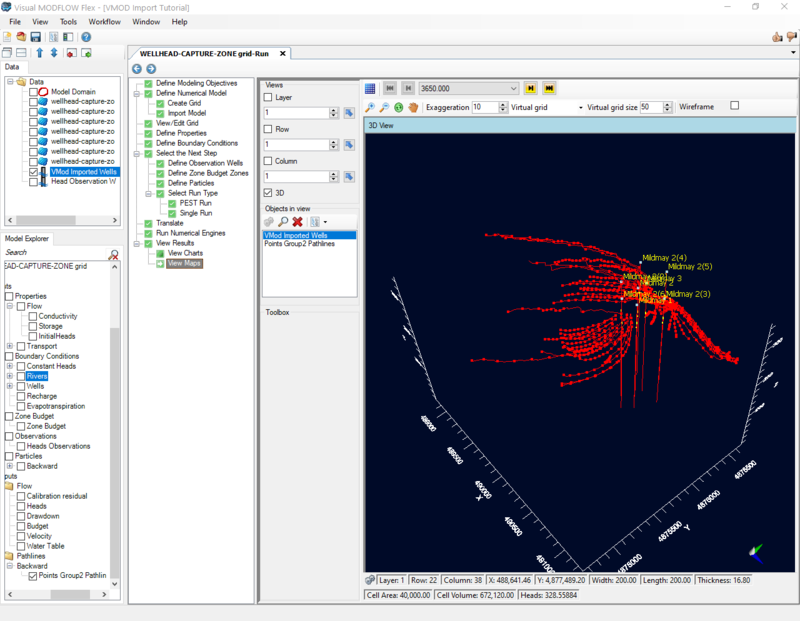 You can find more information about the velocity map display settings in the 3D Gridded Data section of this manual. •Click on View Charts from the workflow tree, and a blank charting window will appear. 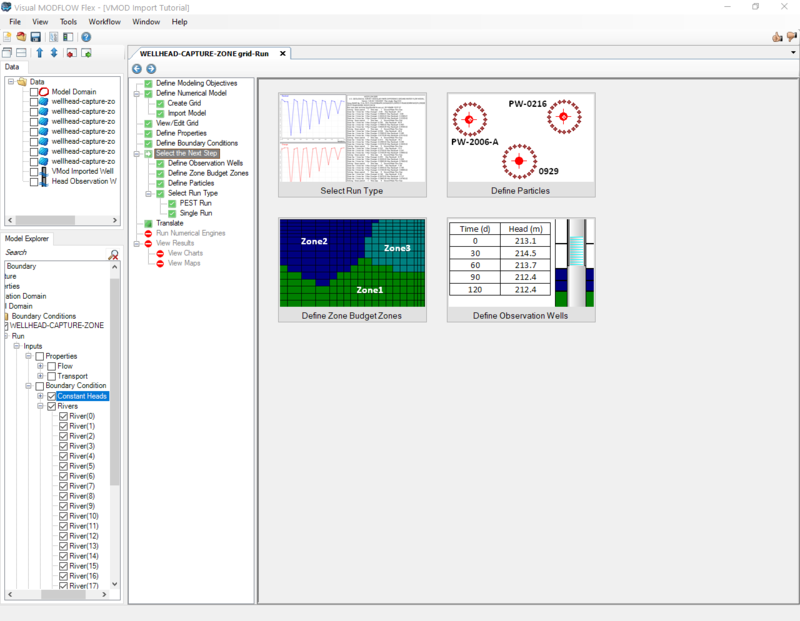 •To the left of the chart window, you can choose what observation data to view; select individual wells, or see wells that belong to a specific group. After making a change to the well(s) selection, click on the [Apply] button to update the chart.